Calendars are an integral part of one’s life. Each important event of one’s life is decided on the basis of a calendar. Different civilizations have adopted different calendars and follow the same. One such calendar is the Makkah Calendar 1439 or the Hijri Calendar 2018. The Islamic or Hijri Calendar is based on the Ummul Qura System, Saudi Arabia and it covers Hijri years 1439 – 1440 AH. The Islamic calendar is followed by the Muslim communities all over the world. As per the calendar, we are in the current Islamic ear 1439 AH (Al-Hajj). 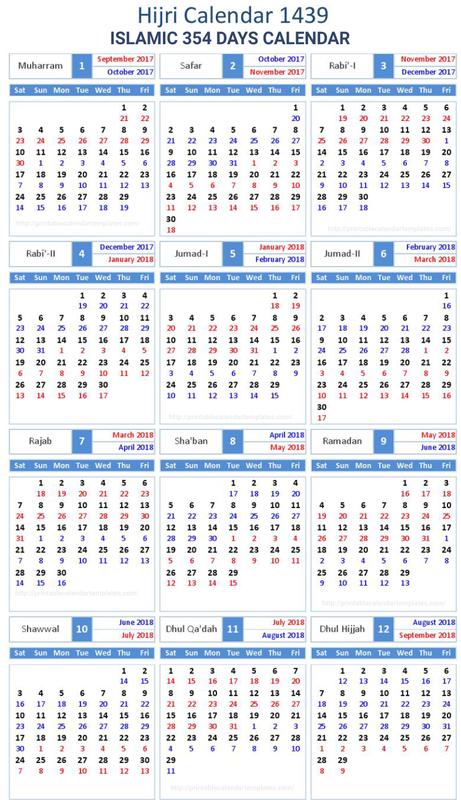 The specialty of this calendar is that it provides information about all important dates and Islamic festivals. The normal calculation starts from January to December, while the Hijri calendar for the year 1439 starts from the month of Muharram. As per the Islamic calendar, Ramadhan falls in the ninth month, one of the pious months for them, where they commemorate the first revelation of Quran to Prophet Mohammad. During this entire month, the Muslims observe fast until the day they see the new moon, which is marked as Eid. 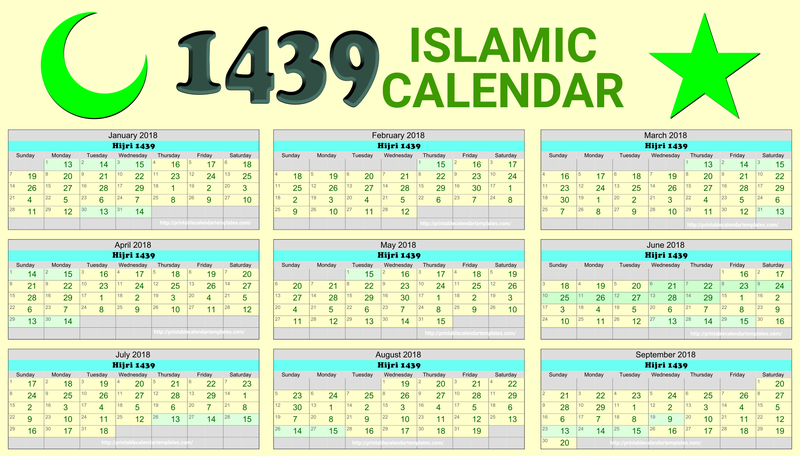 Unlike 365 days in a year, as per the Hijri Calendar, there are only 354 days in a year. This calendar is designed based on the positions of the moon and its movement. The day a new moon is observed is marked as the starting of the month. Although the appearance of the moon is influenced by weather and certain other climatic conditions, this is considered as the ideal way by the Islamic people to evaluate their future events and all important festivals. Hijri calendar can also be considered as a lunar calendar consisting of 12 months, where each month consists of either 29 or 30 days. These calendars are not easily available over the internet, but a few websites do provide them for downloads. You can even use a pocket-sized calendar to keep yourself updated with all the necessary and important events coming up. The most important festivals as per the Islamic calendar 2018 is Ramadan, where the Islamic people keep fast for a month and then celebrate Eid on the sight of the first moon after a month. During the month of Ramadan, they are supposed to keep themselves clean and devoid of all evils. Not just evils of the society but those of the mind as well. Eid is first celebrated in the Saudi countries, i.e. Saudi Arabia. On the sight of the moon in Saudi, it is considered that the festival Eid has commenced. Festivals and important dates there are different and are marked on the sight of the moon only. People tend to follow these calendar to obtain optimum results in each phase of life. These calendars are available in different design and formats. You can download a PDF, use it as a pocket calendar or even get a printed soft copy or a hard copy from different shops. Although the dates and the way of determination of dates of a calendar for the Islamic/Hijri calendar, vary from other civilizations, but the significance of the festivals and important dates are the same and will remain the same in all the ages. At times, there is a delay in determining the exact day of a festival, as due to certain environmental phenomenon and weather conditions, the moon is not visible in time. People living in the North and other regions are highly dependent on the first declaration of dates that are made from Saudi Arabia. It is their staunch belief that the sight of the moon is the best way to figure out and initiate a good work, consider it as a good date or as a date for a festival as that brings fortune and good luck. The ancient prophets were the ones who developed and prepared this calendar as per their calculations and it is still prevalent. Today, each mosque has prophets and disciples who teach the basics of looking into a calendar and the ways in which one needs to look up for a festival. The declaration made by the prophet of a mosque is considered as one unanimous decision and everyone follows the same. Hijri calendar is also the same, only adorned with a different name. Hijri calendar and the normal Gregorian calendar, developed by Maya civilization can be clubbed together and used as one calendar. All it needs is an understanding of both these calendars and expertise to figure out what month of the year it is and which festival or important date it is. It is up to one to plan the events of his life based on any one of these calendars or both. Be whatever the case, had there been no calendars, we would not have a way possible to figure out which date of the month it is, which era we are in and what it feels like to consider a particular date as the day Eid is to be celebrated. It is this dates, that we eagerly wait for knowing that after a certain time Eid would come and we would rejoice and enjoy. Islamic calendars or Hijri calendars has made this possible for all. 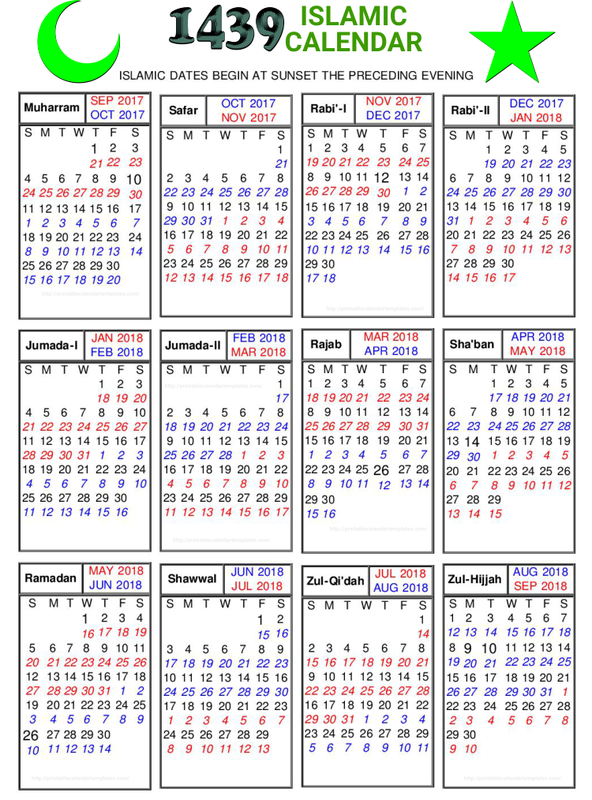 Here at this page, you would find a downloadable and readable version of the most recent Islamic and Hijri calendar 2018. Visit the page and take a dig out at the most important dates in the upcoming year and go about planning your life accordingly right from the start so that you can enjoy the coming year to the fullest.